As football fans we’re always looking back on the good times; the moments that made us laugh and cry and the moments we’ll either never forget or do our best to wipe from our memories forever. But what about the future? What do we have to look forward to? Can we get excited about what’s to come or should we continue to yearn for yesteryear? 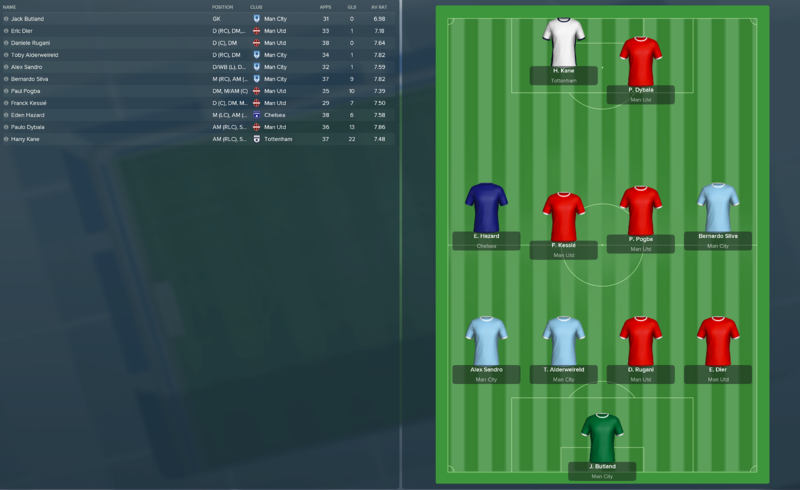 As part of our Premier League 25 years celebration this season, we’ve decided to boot up our copy of Football Manager 2018 and simulate 25 years into the future to see what exactly we’ve got to look forward to. And without wanting to wish our lives away, we’re in for a real treat if this is what the future holds. Pep Guardiola’s Arsenal endure a frustrating summer window as the lack of Champions League football this season leads to top scorer Andre Silva pushing through a £54m move to Monaco. Laurent Koscielny also leaves as he joins Nice for just £1.8m. They do pull in almost £80m in transfer fees but only spend £50m on reinforcements – Munir is signed from Real Madrid in £23m deal, presumably as Silva’s direct replacement, but fans are extremely underwhelmed. 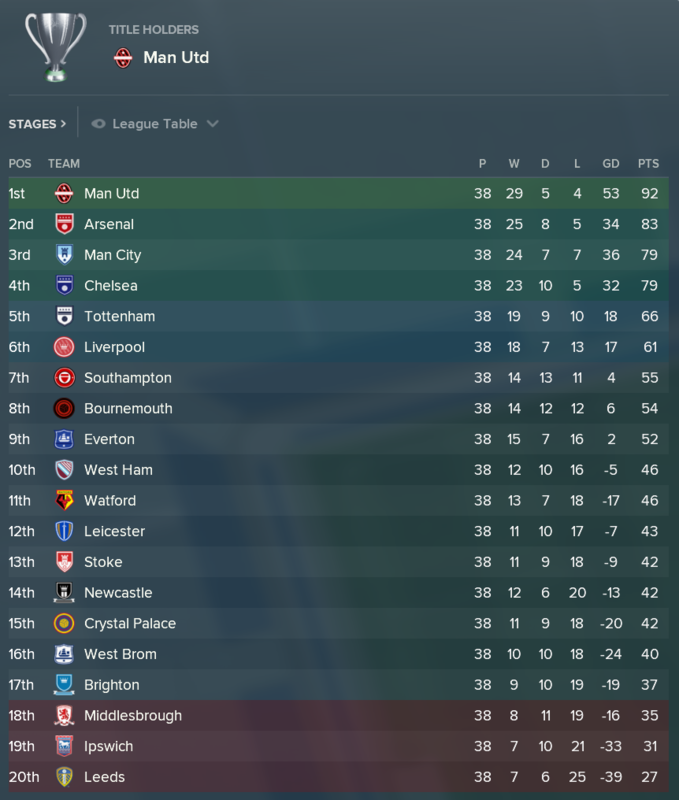 It seems, even five years in the future, the Gunners still can’t do transfer windows properly. Manchester United, as Jose Mourinho goes in search of a record fourth consecutive Premier League title, spend over £120m – the pick of the bunch being the shock swoop for Valencia’s Simone Zaza for an initial £40.5m, rising to close to £60m with performance based add-ons. AC Milan’s Suso also arrives at Old Trafford for over £40m. The only departure of note is promising young star Timothy Fosu-Mensah, who completes a permanent switch to Russian outfit Akhmat in January. On the other side of Manchester, City boss Allegri spends over £200m in an attempt to build a squad capable of ending United’s dominance – Atletico Madrid’s Saul Niguez joins for £76m while they tempt Philippe Coutinho back to the Premier League in a £74m deal with PSG. Jack Butland finally leaves Stoke – signing a deal worth £28m. Benjamin Mendy (Zenit), Douglas Luiz (West Brom) and Nicolas Otamendi (Lazio) all leave on permanent deals while Kyle Walker is sent to Bournemouth on loan. Liverpool, without the pull of any type of European football this season, still manage to tempt 22-year-old wonderkid Joao Felix to Anfield after paying Benfica £39m for his services. On New Year’s Day, Simon Mignolet leaves for Galatasaray. Chelsea, another club desperate to compete to return to dominance in the Premier League, also spend big as Joachim Low raids Bayern Munich for Andrea Belotti and Rafinha in a combined deal worth around £103m, rising to £142m with add-ons. Domenico Berrardi also signs in a £30m switch from Sassualo. Antonio Rudiger (PSG), Marco van Ginkel (Newcastle) and Lewis Baker (Blackburn) all depart. Tottenham fans continue to be excited for the future as they see Kasper Dolberg and Justin Kluivert arrive on the same day – Daniel Levy working his magic by managing to only part with less than £40m for the two of them combined. Juan Foyth is the only permanent departure from the New White Hart Lane as he signs for Villarreall in a £5.25m deal. Elsewhere, Southampton pay West Ham over £12m for Jack Wilshere’s signature, Leo Goretzka joins the Hammers on a free transfer after leaving Schalke, Brighton shock everyone with the £17.75m capture of Dortmund’s Maximillian Philipp, Ipswich Town sign Vincent Janssen from Huddersfield for £10m, Edin Dzeko joins newly promoted Leeds United on a free and contract rebel Demarai Gray leaves Leicester City for West Brom for free. Apart from the likes of Dzeko, Goretzka and Philipp making surprise moves in the transfer windows, the other standout moves are Robert Snodgrass swapping Crystal Palace for AEK Athens, Gylfi Sigurdsson leaving Everton for Leicester in a £9.25m deal, James Ward-Prowse also securing a surprise exit from Southampton as he signs for the Foxes for a bargain £6.25m and former West Ham flop Jonathan Calleri joining Newcastle on a free. Elsewhere across Europe, the biggest deals involve Bayern Munich and PSG. The Bundesliga giants snap up Leverkusen’s Julian Brandt and Julian Weigl from Dortmund for a combined fee of £126m while oil-rich PSG spend £67m on Dortmund’s Moussa Dembele. As the years go by, the names we all know and recognise are beginning to fade as new faces are appearing – because of retirement, obviously. This is where it’ll get interesting. As many predicted, Man United make history by becoming the first ever team to win the Premier League four times in a row. Just like previous seasons, they’re given a free run to the title, ending the season nine points clear of runners-up Arsenal. It is the Gunners who perhaps surprise everyone this season following an underwhelming summer transfer window and deciding not to sign anyone in January. Man City and Chelsea make up the rest of the top four comfortably as fifth placed Spurs finish 13 points of the Champions League spots. Liverpool are able to creep back in to the Europa League by finishing 6th. While the race for the title was a foregone conclusion for much of the campaign, the battle to stay in the Premier League was once again the biggest talking point. Leeds’ return to the top-flight was a dissapointing one as they finished bottom and 10 points from safety but it was Brighton who were able to join the long list of clubs to have performed a Great Escape. They looked dead and buried going in to the final four game but draws against Newcastle and Tottenham were following by emphatic back-to-back wins against Southampton at home and Liverpool at Anfield, securing their Premier League status at the expense of Middlesbrough. Boro had looked safe but as Brighton lifted themselves out of trouble, Paulo Sousa’s men struggled for results and failed to win any of their last three games, picking up just two points. In the eyes of the media, Leicester were the biggest underachievers as they were unable to live up to their pre-season prediction of finishing 7th and eventually had to settle for 12th. Southampton and Bournemouth, predicted to finish 10th and 11th respectively, were the season’s big overachievers as they finished well inside the top 10. As mentioned above, Arsenal’s second-place finish came as a shock to many having been tipped to finish 5th by the media before the season began. There were early fears that Man United would not make it four-in-a-row when they fell to a 2-1 away defeat to Newcastle on the opening day but were able to recover quickly and immediately started a 14-game unbeaten run before being stopped by Middlesbrough in a 2-1 defeat at the end of December. Defeats to Liverpool and Chelsea after the turn of the year didn’t make much of a difference in the title race as Mourinho’s side ended the season with eight wins in a row. Arsenal will be disappointed not to have put more pressure on United, though. A nine-game unbeaten run at the beginning of the season was brought to an abrupt end by rivals Spurs in a 3-0 demolition job at the Emirates. Winning just three of their final eight games meant the Gunners were unable to mount a late surge for the title. Amazingly, Everton were one of the favourites to secure a top six finish but they followed a run of one defeat in eight games during February and March with just three points from their final eight fixtures, meaning they had to settle with 9th. Leeds, who only won three games in the first half of the season, lost just one of their final six games. But by then it was too little, too late. 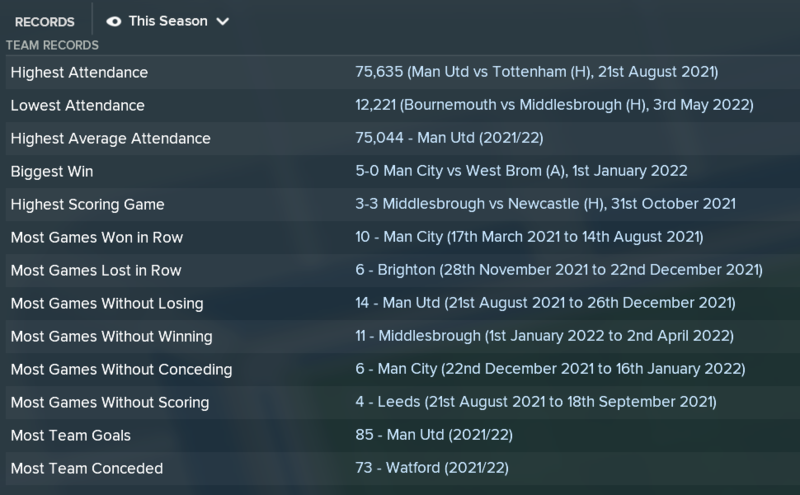 As you can see, Man United’s unbeaten run of 14 games went a long way to ensuring they lifted yet another Premier League crown while Middlesbrough’s 11-game run without victory essentially allowed Brighton a chance of survival. Harry Kane wins the Golden Boot with 22 goals in 37 league appearances. It takes him to 165 Premier League goals and he is now fully expected to break Shearer’s record of 260. Less than 100 to go, surely he’ll do it. Close behind him was Man City’s 21-year-old striker Pietro Pellegri with 21 goals. His start to life in England is hugely impressive, having scored 59 in 84 first team appearances in all competitions since arriving two seasons ago – 40 of which were in the Premier League. At this rate, he’ll be giving Harry Kane a run for his money with Shearer’s record in sight, and will no doubt overtake Sergio Aguero as Man City’s all-time top scorer. Chelsea’s Andrea Belotti enjoys a successful maiden season in England with 19 Premier League goals, former Hammers flop Calleri shockingly nets 15 league goals for Newcastle while Arsenal’s Munir, who was under pressure to successfully replace the departed goal machine Andre Silva, scores 14 league goals. The Golden Glove goals to Man City’s new No.1, Jack Butland, who registers 14 clean sheets and concedes just 26 goals all season, ending David De Gea’s run of three consecutive Golden Glove awards. Mesut Ozil, who is still at Arsenal, ends the season at the top of the Premier League assists charts with 15, two ahead of Liverpool’s Naby Keita. Man United’s Paulo Dybala is named Player of the Year for the second time in three years while Pietro Pellegri is named Young Player of the Year. The Manager of the Year, unsurprisingly, is Jose Mourinho for a second season in a row. The Premier League Team of the Year is once again dominated by the Manchester clubs, with just Chelsea’s Eden Hazard and Tottenham’s Harry Kane preventing it from being a full Manchester-made XI. In what may come as a surprise to many in the modern game, only five teams opted for a change of manager during the season. The first came in November as Eddie Howe was relieved of his duties at West Ham after losing the dressing room – he was replaced by former Wolves and Southampton boss Nuno Santo two weeks later. Leicester’s underwhelming start to the campaign resulted in Rafa Benitez losing his job at the beginning of December and being replaced by former Liverpool boss Vincenzo Montella – the Italian proves to be a shrewd appointment as he guides the Foxes to FA Cup glory in May. It doesn’t take long for Eddie Howe to find a new job after his dismissal from West Ham as Brighton offer him the chance to return to the south coast following their decision to part ways with Manuel Pellegrini. Howe goes on to perform the Great Escape for the Seagulls. Elsewhere, Newcastle make the slightly odd decision to swap Walter Mazzarri with Ipswich’s Mick McCarthy and Ipswich react to losing McCarthy by nabbing Reading’s Marcin Wasilewski, who takes them down to the Championship while Reading wave at him on the way up as they’re promoted via the Play-Offs. What to expect next season? Obviously, Man United will have their sights on a fifth consecutive Premier League crown – their 25th English top-flight title – as Jose Mourinho continues to go all Sir Alex Ferguson on the red half of Manchester. City, of course, will want to be United’s biggest challengers having fallen well short over the last few seasons. The absolute minimum aim for both Tottenham and Liverpool will be fighting their way back in to the top four. As the top six consistently dominates the Premier League, clubs like Southampton, West Ham, Everton and perhaps even Leicester will have one eye on challenging the norm in 2022/23 and there will also be many eyes on Bournemouth, to see if they can push on from their superb 8th placed finish. Newly promoted QPR and Reading will obviously want to prove they can compete at the top level and stay there.